Some meat (or not). 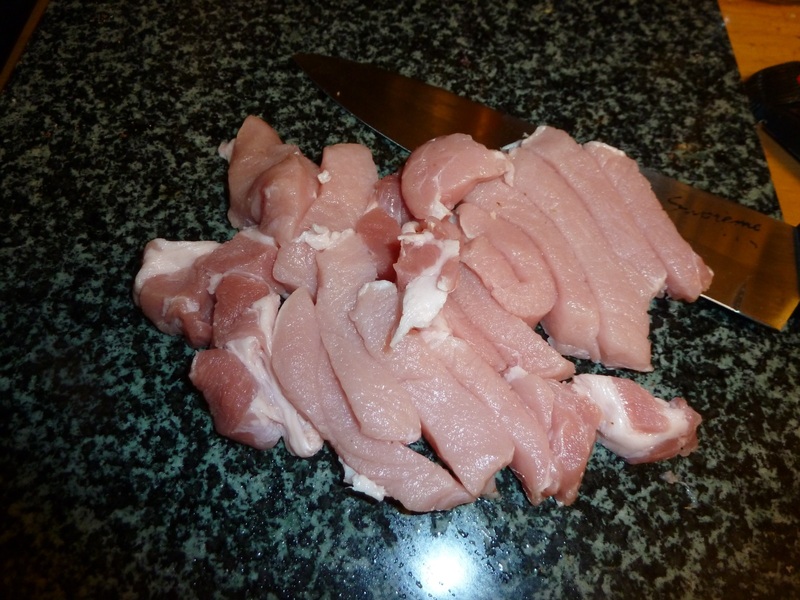 I used 2 Pork Loins, cut into strips (about 240g total). Just over £1, as it was on a deal at Aldi. If you’re avoiding meat, a few more mushrooms helps. Make sure your veg are all different colours! Sauce. You can make your own, but Aldi had either Sweet’n’Sour or Oyster’n’Onion packs at 35p! I went for S’n’S. Noodles. I skipped them this time, but “Straight to Wok” noodles are cheap and plentiful. Don’t over-do it though! You’ll end up with NOODLE and stir-Fry! Read through the entire Method. Check you have got all of the ingredients and tools, and understand each process. Get all the ingredients nearby. Check you have everything. Chop your veg, if you didn’t buy pre-chopped. They want to be quite small, but not wafer-thin slivers. Or you can leave them chunky. 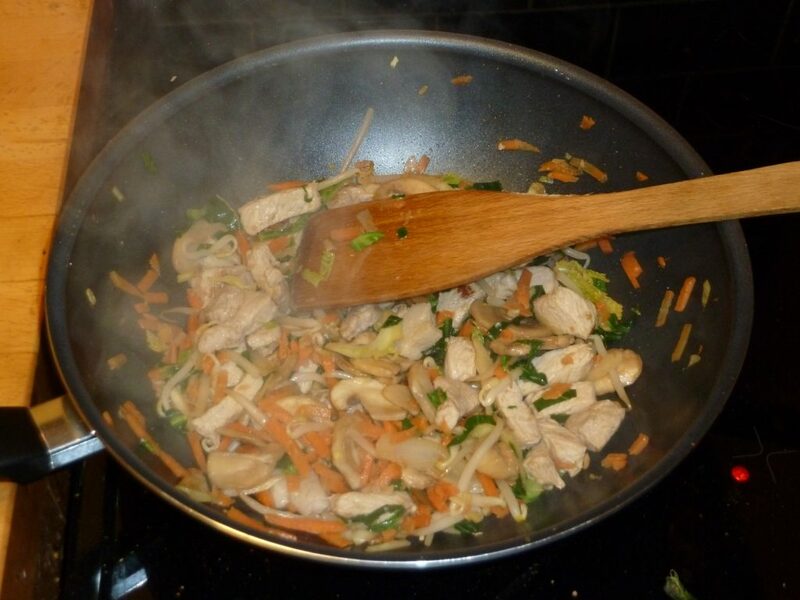 Heat a little oil (I use Spicy Stir-Fry Oil – adds a little kick, and resists the high temperatures) in a wok (High Heat. On my cooker, I use Level 5 (out of 6). You may choose to use ‘6’. I do not think ‘4’ is hot enough). While the oil is heating, chop up your meat (unless you bought it pre-chopped, in which case, just wait for the oil to reach temperature! There should be just enough time to TXT a friend: “HEY! I’m Cooking! Yeah, me! Cooking! Gotta go, kitchen on fire!“). 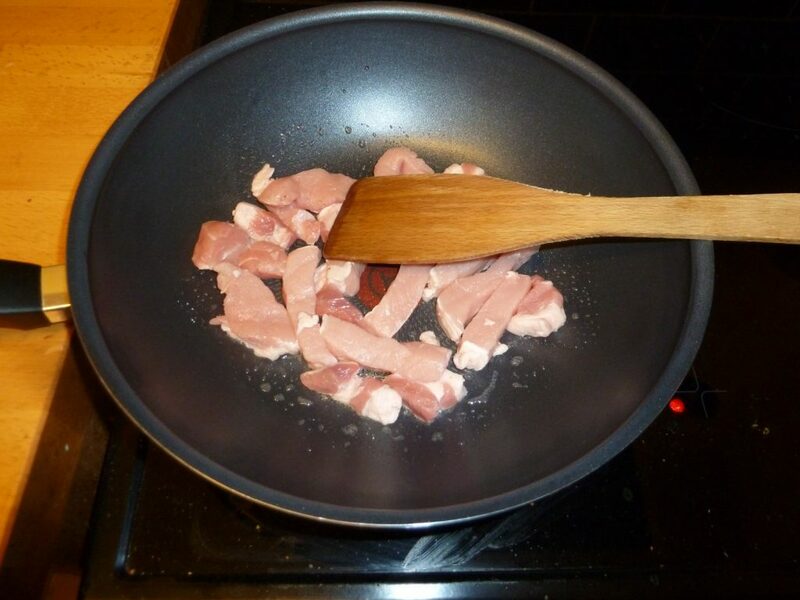 The oil should be hot enough by now, but you can throw a little piece of meat in to check – it should sizzle! 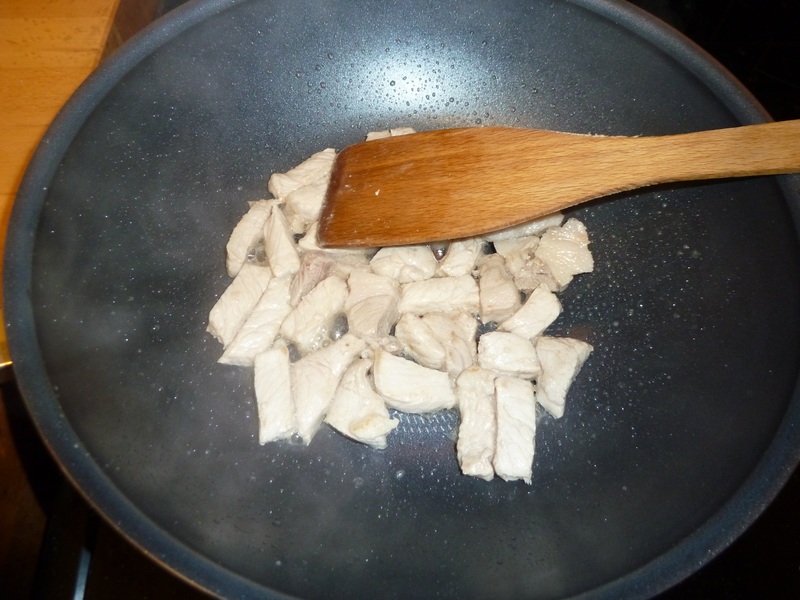 Carefully place the meat in the wok. Beware, it may splash hot oil! The Meat Is In The Wok! You can take a moment now, as the meat starts to cook, to clean down your meat-chopping surface. Be quick-but-thorough. Now stir the meat (cf: name of dish!). 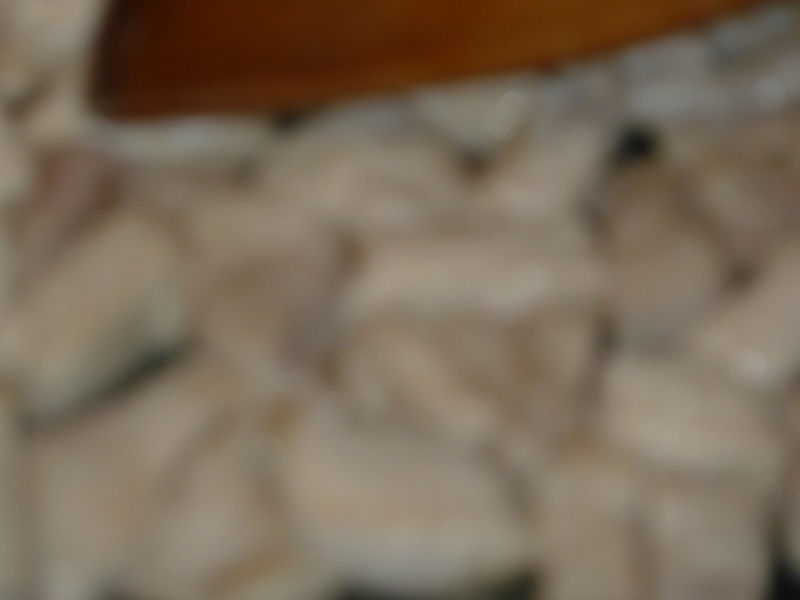 Keep stirring, not too fast, until the meat is about cooked. Make sure to turn it over regularly, cooking all sides, and allowing the heat to reach the centre. This should take a few minutes. If, after 5 minutes, the meat is not starting to brown, you have the heat too low! Use the Zoom function, from further away! Now that the meat is cooked, and we have a decent photo of it, we can add the veg. Pop it all in the wok. 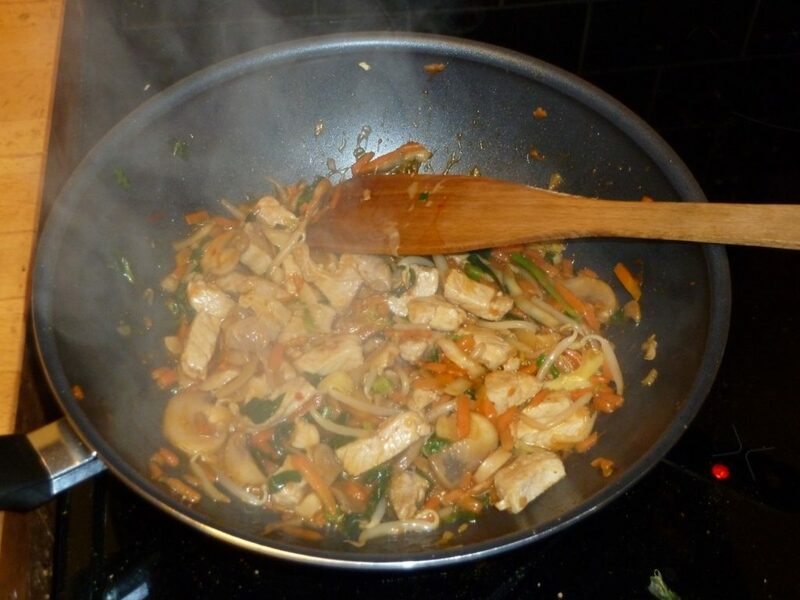 We now refer back to the Dish Name: Stir the veg (and meat! ), turning over, and making sure it all gets nice and hot! A couple of minutes of stirring, and the veg will be starting to cook through, and wilt a little. It will be noticeably reduced in size. We can now add the sauce. Depending on the sauce, this can be a bit messy. Sweet’n’Sour is sticky, and gets everywhere if you’re not careful! Stir some more (are we getting an idea of where the name came from yet?). Don’t go splashing it everywhere, and throwing it all over the hob. A nice, gentle motion, just to keep it moving so it cooks evenly, and the sauce covers everything. If you are using noodles, now is the time to add them! (I often skip them, but they do bulk it out nicely). 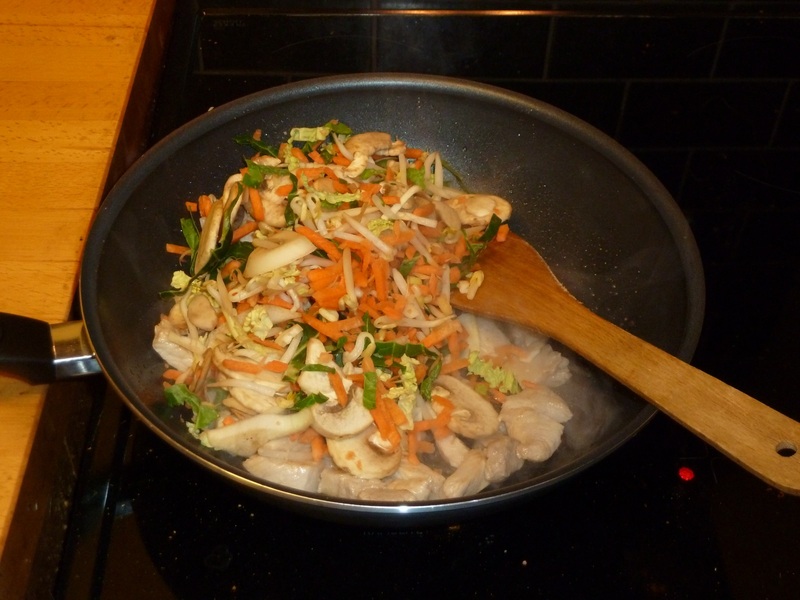 Stir the noodles in, but no more than a minute (unless your packet says otherwise!). The meal is now cooked, and can be spooned into bowls. 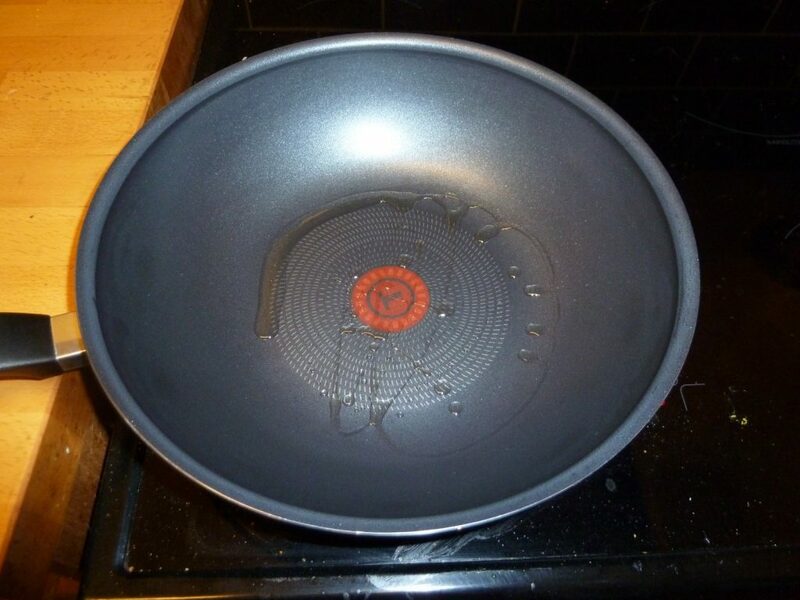 Pro-tip: keep the bowls very near the wok, so as not to spill food all over the oven/counter/floor! Sit at your favourite table, and savour your creation! 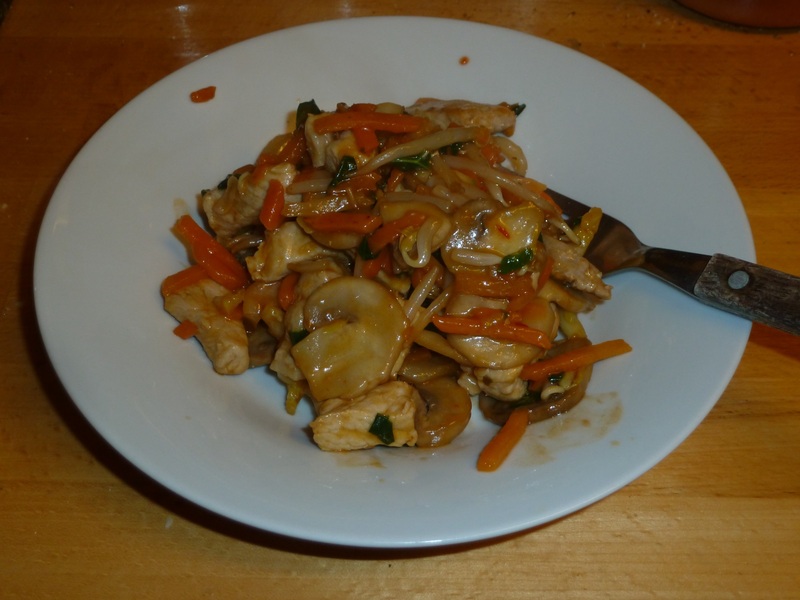 This entry was posted in Behind The Scenes, Food and tagged behind the scenes, food, how-to, stir-fry on January 26, 2018 by The Crystal Wizard. 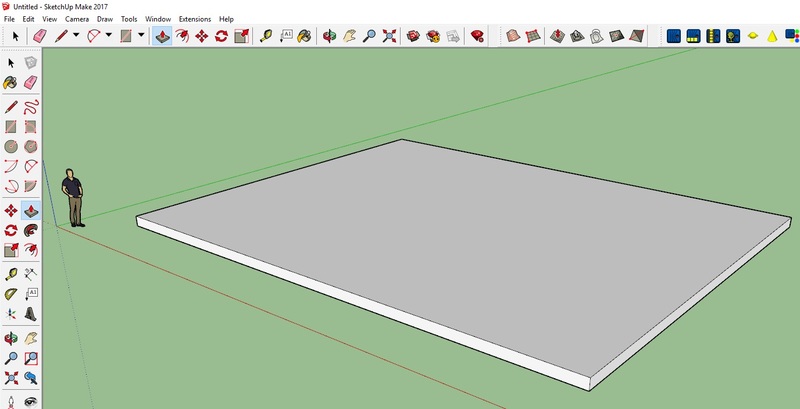 In my previous two posts (One, Two), we learnt some basic techniques for creating models in SketchUp. Now, I am going to jump directly to using these, and other, techniques to build a detailed Scene. Don’t worry if you struggle to follow this on the first time through! You can always start over, and slowly build up bit-by-bit! You may download it directly from me by clicking to show the full Image, and then Saving to your Downloads folder. 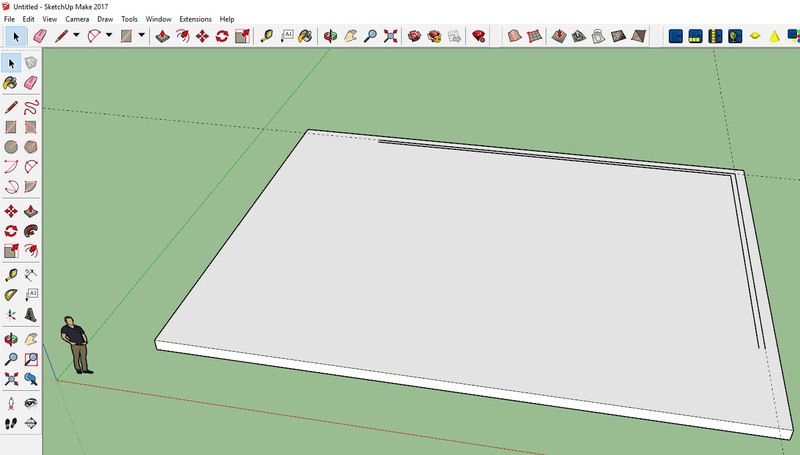 Now we can open SketchUp, and start to build! First, we need a surface to work on. 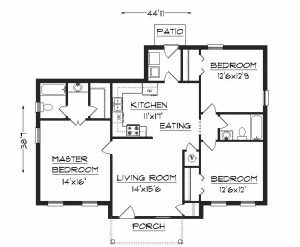 Draw out a Rectangle, and size it to be a little bigger than the House will be. 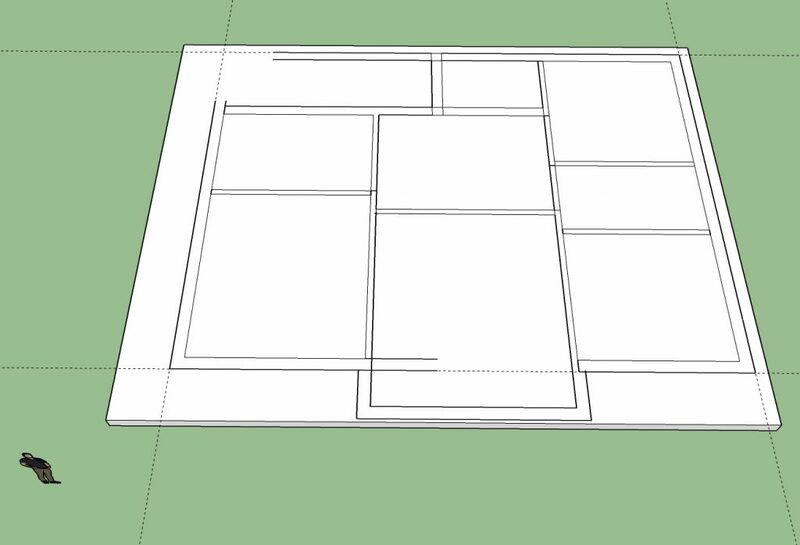 (In my example, we can see that the house will be 44’11” wide and 38’7″ long, so I will make my Base 50’x40′. Remember that we can get exact dimensions by typing them!). I like to give the base some Thickness, so use the Push/Pull tool to bring it up by 1′. Now we can start to build the outer walls. New Tool: Tape Measure. Draw guide lines 1′ from the Right and Top edges. Now, using the measurements supplied (or worked-out/guessed-at! 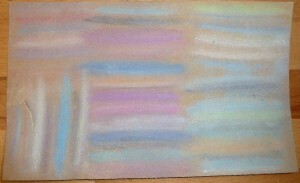 ), we can fill in the rest of the walls. Now we can get rid of the Guides, and extraneous lines. The Guides are easy. Edit Menu -> Delete Guides! Trickier is erasing all of the extra lines, without clearing lines we want to keep! Now use the Push/Pull to raise the walls to exactly 8′ high. 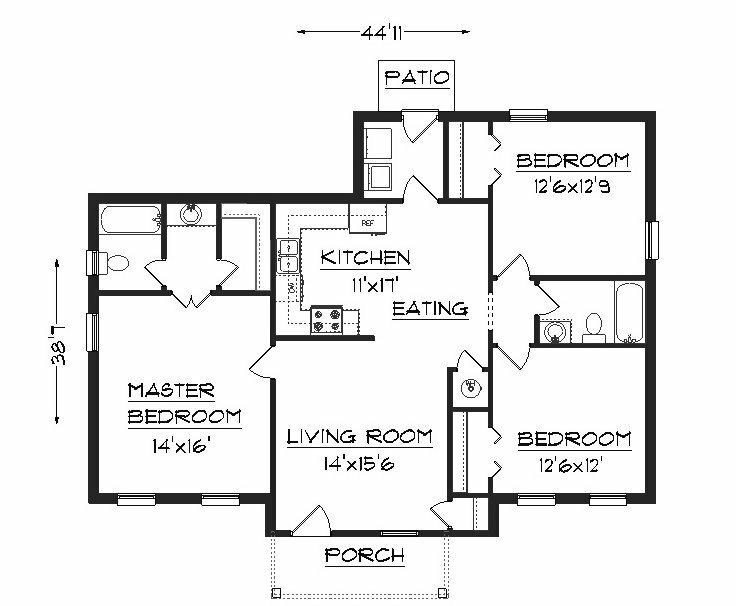 Here is your basic building! in Section 3a, we will move on to detailing it to actually look like a house. Doors, Windows and textures! We WILL be seeing our old friend the PushMe/PullYou again, and I will also be introducing the Sketchup Warehouse! This entry was posted in Art, Computers, Design, Technology and tagged Art, behind the scenes, computers, how-to, sketchup on October 27, 2017 by The Crystal Wizard. SketchUp Two. Copying, Scaling and Detailing. 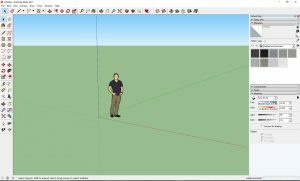 In my previous post (SketchUp – A Beginner’s Guide), I introduced some basic concepts of the 3D modelling software. 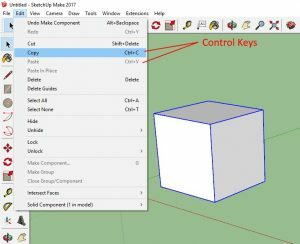 How to make and move basic objects. Now we move on to slightly more advanced (don’t worry, not very advanced! We’re taking baby-steps here!) techniques. Once you have an object, it is a simple matter to duplicate it. Actually,. it is several simple matters, depending upon your preference. Select your object. You may notice that only part of the object is selected! We need to cover this first! First, extra-clicks. A single click will select a single item, such as a Face or a Line. Double-Clicking will select a Face and surrounding Lines. A Treble-Click will select ALL connected items! This is very useful fro a free-standing object, but care must be taken when you have interconnected objects! A way to avoid interconnected objects is, as mentioned before, to make your objects into Components. This will stop them from interacting with other objects, and make them easier to select individually. 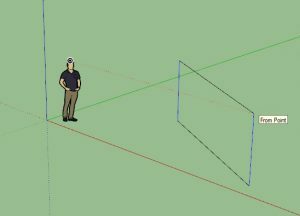 A third way is to drag a box around your object, but this has the danger of selecting unseen items, such as the rear faces and lines. The more eagle-eyed of you will have noticed the Control Keys noted at the side of the Menu Functions. These are keyboard shortcuts that you can press, instead of moving the mouse to the Menu, clicking on the Menu, moving the mouse to the correct option and clicking on that option! E.g. instead of choosing Copy from the menu, you can hold the CTRL key, and press the “C” key. Now we have a copy in the buffer, either use the Edit Menu -> Paste, or press CTRL-V to Paste the Item into the scene. To begin, it will be “floating”, and you can move it to the required position, before clicking to actually place it. You may create an object, and then want to make it a different size, or have a copy of an object as a different size. This requires the Scale Tool. 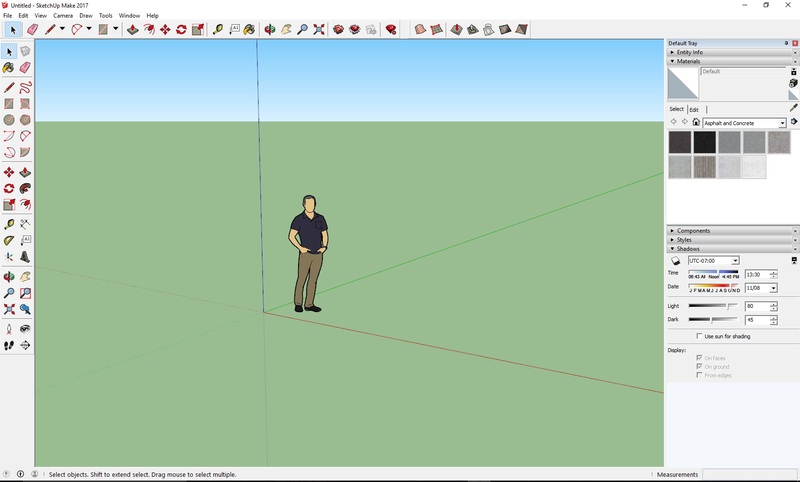 Select the object you wish to Scale, and then click the Scale Tool. You will see lots of yellow “handles” appear over the object. These can be use to drag/stretch the object. Some handles will only stretch in certain directions, while the corners will stretch all dimensions. Try some, and see how it works! As with other functions, the Dimensions box in the very lower right of the screen will keep a track of how much you are scaling the object. And, as an added extra, you can type a Dimension to set it exactly! Start pulling a handle, and then type 2 <Enter>, and your object will be Twice the size! type 0.5 and it will be half as big as it started! Useful for when exact ratios are required. And an extra bonus feature, you can scale it to an exact distance! Try stretching and then typing 6″<enter> or 3m<enter>. You should see the object become the size you indicate! It is quite rare that all you will want in a scene is a plain cube, or even several cubes of different sizes. So we need Details. There are so many different ways we can alter an object that I can only discuss a few in this article. A very useful feature, this allows you to move a face, or part of. To Push/Pull a complete face, simply select the Tool, and hover over the Face you wish to move. You should see the familiar blue spots, showing the selected face. Holding the left mouse button down, you can Push/Pull the face. Notice how the Snap Effect can be used to line up the face with other Objects in the scene. To move just part of a face, you must section it off using the Pencil tool. Draw a line splitting the face, and then proceed as before. 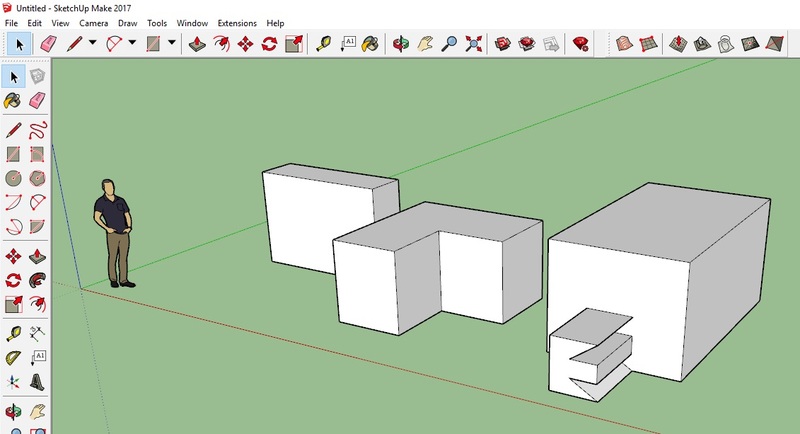 The examples (right) show (l-r) a cube with the whole face pushed back, one with a line splitting the front face in half, and the right pushed back, and one with a design Drawn on, and then Pulled forwards! NOTE: If you are working on a Component, you must first double-click the component to make sure you are working within it, rather than on the main scene. Also, be aware that alterations made to One component will affect all copies of that component! This tool can be used to create many effects, including removing a section from an object by Pushing it until it is level with the opposing face (Snap Effect!). We’ll leave it there for today. Practice with these tools, and experiment with creating your own Objects. Let me know how you get on, and the best examples I receive might get featured in my next post! 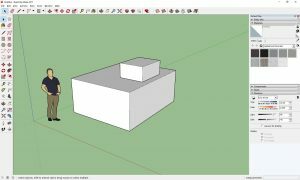 This entry was posted in Art, Behind The Scenes, Computers, Technology and tagged 3d, Art, behind the scenes, computers, how-to, sketchup on October 25, 2017 by The Crystal Wizard. 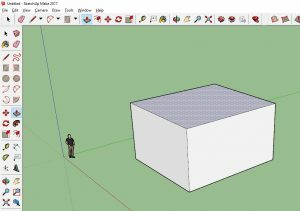 Sketchup 3D design software from Trimble (previously from Google) is a very simple, yet powerful, program. Starting from basic shapes, you can build up to elaborate designs, ranging from small engineering components to vibrant cityscapes. 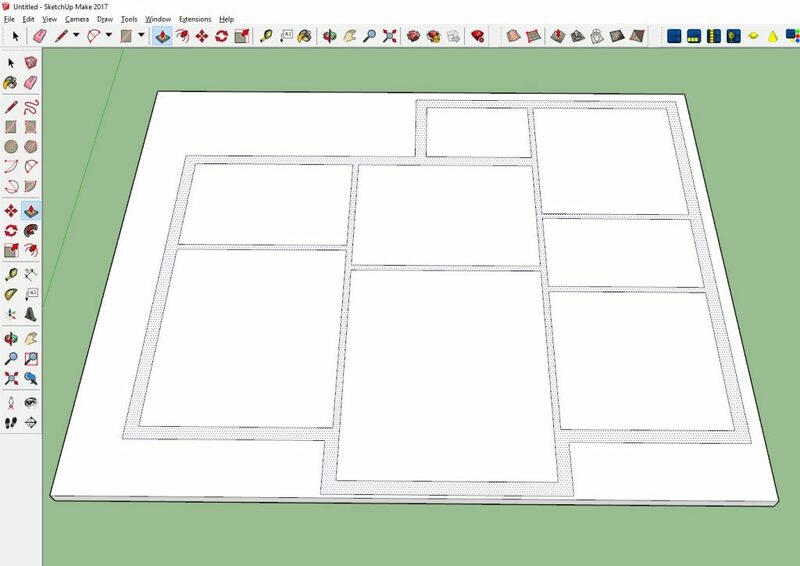 A lot of people are put off from using 3D design packages as they see them as complicated and fiddly, but with Sketchup, this is not true at all! 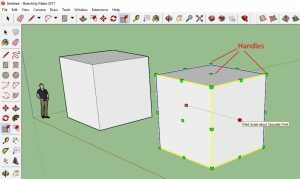 Here I would like to look at some of the most basic features, and how they can be used to create advanced designs. Once you have it up and running, you should see the Main Screen, with tools all around. We shall be learning what some of these tools are for. The Mouse Wheel controls zooming in and out. 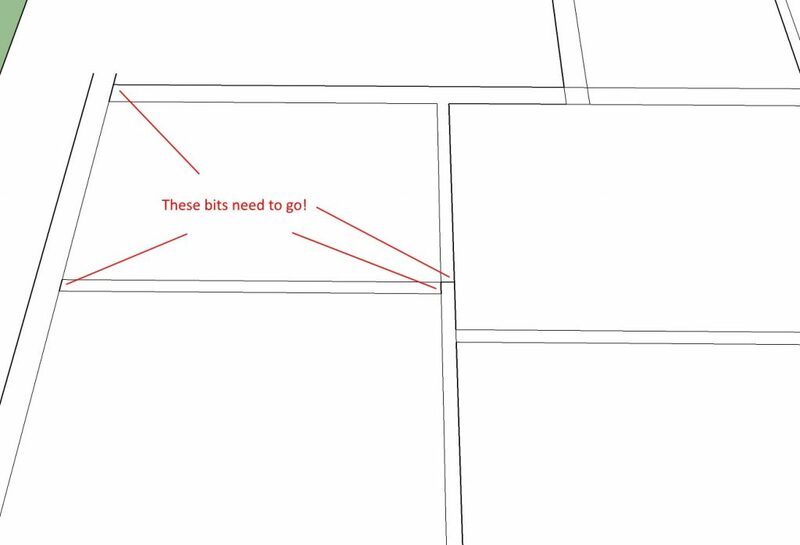 It will focus on where the mouse pointer is, so scrolling out, and then back in can be a useful way of moving around the scene. The Mouse Wheel also controls the angle you are looking from. Holding it down, and moving the mouse will rotate the camera. Left-Clicking will select an Object. You can tell it is selected by the Blue border it gains. You can also do this by dragging a Selection Box around an object, but this will select EVERYTHING it contains, so use caution! Your scene is currently quite bare, so let’s add some features! 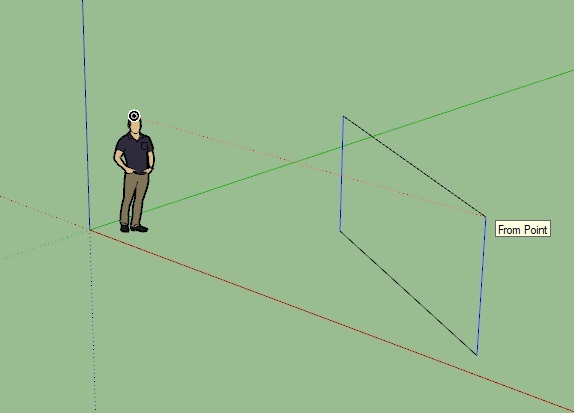 Strangely, for a 3D program, we do not add 3D shapes. We draw 2d shapes, and extrude them. This is easier than it sounds! 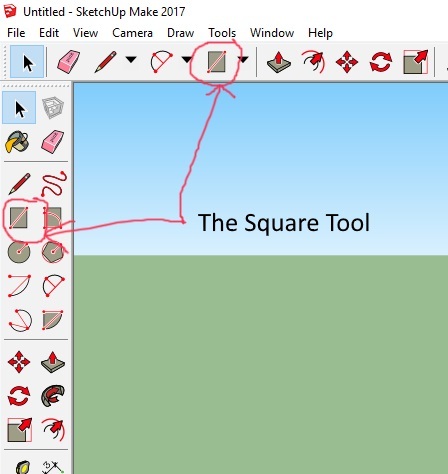 Begin by selecting the Square tool, from either the Top or Left Menu. Your Mouse Pointer will change to reflect the current tool (as always). Click where you would like to begin, and move the Pointer around. You will see the Shape begin to form. If you move around enough, you may notice the useful Snap effect. 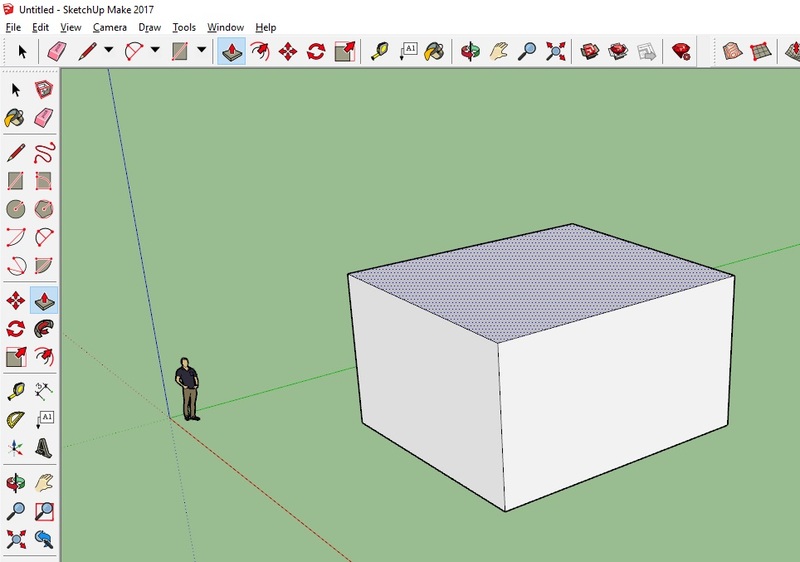 Sketchup tries to guess if you wanted to line up with something, and “snaps” to be level with it. We will not use this now, but be aware of it as you go forwards. You can now test some of the Selection methods. Choose the Select Tool (an Arrow, like a normal Mouse Pointer), and try clicking an edge, or the face. Try double-clicking. 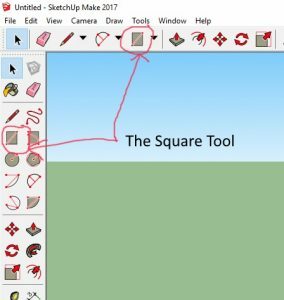 You have a square, but we want a 3D object! So, select the Push/Pull Tool, and move over your Square. You should notice the face become ‘spotty’, to show that it is selected. Click on the face, and move the pointer. The face will “extrude” to form a solid. Again, note the Dimensions area. You can try to get the right height for your box, or click in approximately the right area, and then type the distance you actually wanted! Before we go further, I can’t stress enough about using Groups and Components! USE THEM! 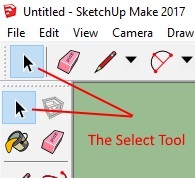 Select a complete object by treble-clicking on it with the Select Tool. This Selects all connected edges and faces. Then press “G” (for “Group”). This locks the object, allows it to be manipulated independently of the rest of the scene, and moved as one piece. It also allows you to replicate objects without having to recreate them, using less memory and being able to edit them all at once! If you move normal pieces together, they will connect. This is good if you want them to, but you cannot un-connect them without a lot of work. 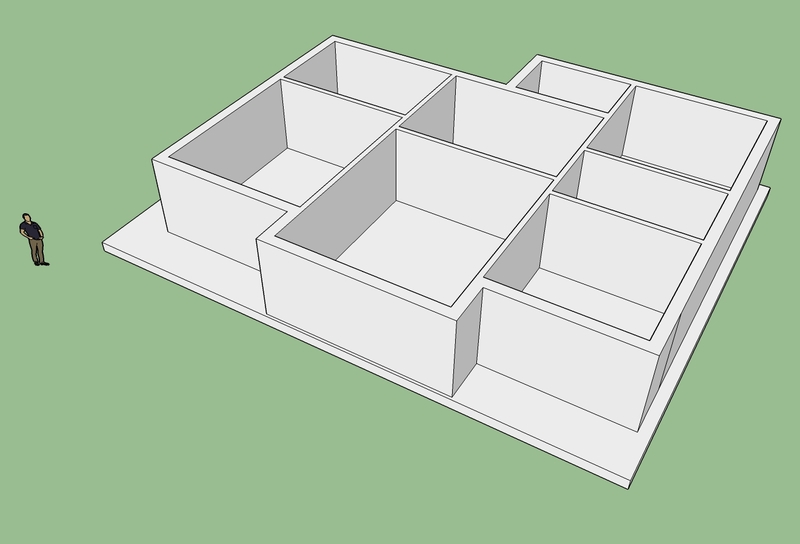 Groups or Components that touch will “Snap” together, but you can move them apart easily! They are effectively their own “mini-scenes”. NOTE: To edit an object once it has been made a Component, you need to double-click it to “enter” the component. Or “Explode it, making ti a non-Component again. I get a lot of use out of the Push/Pull tool, so watch closely! Adding pieces is easy enough, especially using the “Snap” effect. 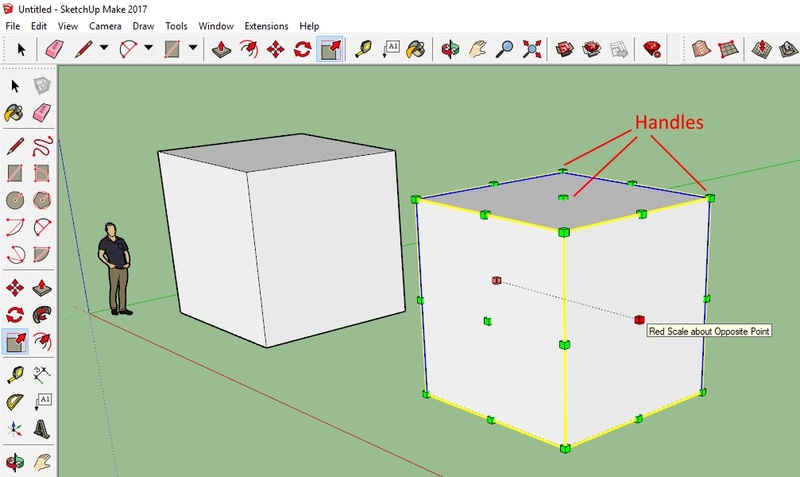 Make two cubes of different sizes. Make them into Components. 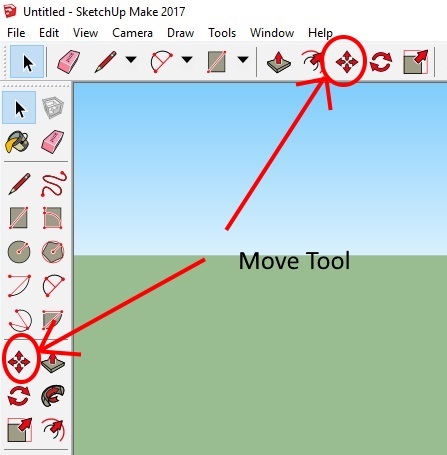 Click on the “Move” tool. Hovering over an object will outline it in blue to show it is selected. You can “grab” any part of it and drag it around. 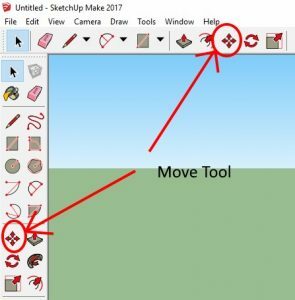 The Snap effect will try to guess if you are moving it along an axis, or you can hold the cursor keys to force it to lock the movement to an axis, if for example, you only want to raise the object without affecting its horizontal position. If you “grab” an edge, or corner, you can take advantage of the Snap, and line it up with another object. Try this with your two cubes. Put the smaller cube on top of the larger. Rotate the View to make sure they are in the right place, with no gaps. You should now be able to create and move blocks in your scene. 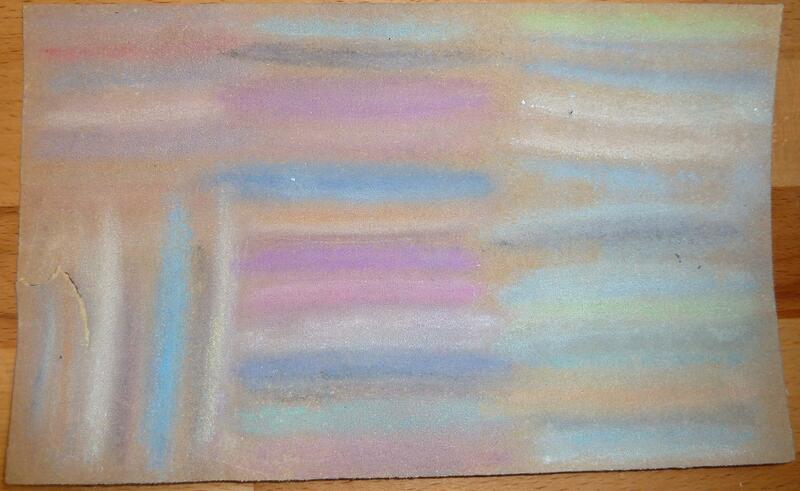 The best idea now is to practice this, creating blocks of specific sizes, placing them together in specific ways. Do not forget to save your work! Have a go at this, and let me know how you get on! The next part will deal with some other basic techniques. If you have any features you wish to know about, feel free to let me know! 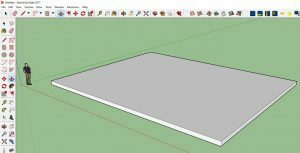 This entry was posted in Art, Design, Introduction and tagged 3d, Art, behind the scenes, computers, sketchup on September 1, 2017 by The Crystal Wizard. To try to keep a coherent feel cross the Mad Dwarf brand, I have begun rebuilding the PC Wizard website. Taking the main Mad Dwarf site as a template (as I have with Crystal Wizard and TechNo Prisoners), I have kept the blue and white of the original PC Wizard, giving a level of continuity. I still have a few details to iron out, but it has been a reasonably easy job, copying text from the existing site into the new template, and tweaking to account for the design differences. It will soon go live, at which point there will be an announcement, and possibly a Grand Re-Opening! Watch This Space! This entry was posted in Behind The Scenes, Computers, Design and tagged behind the scenes, computers, website on February 21, 2017 by The Crystal Wizard. 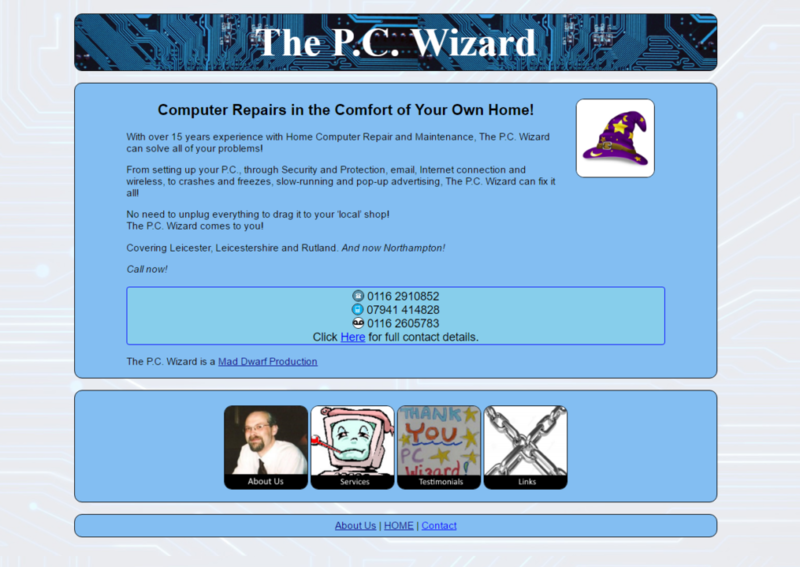 As you may have noticed, the main site, thecrystalwizard.co.uk, has undergone a redesign. This is part of the recent re-acquisition of our Mother Site, maddwarf.co.uk. Mad Dwarf Productions (MDP) was the original “umbrella organisation” for all of my projects, but due to circumstances beyond my control, the website fell into disrepair. My recent projects sprang up without the guiding light of MDP to keep them coherent, and the designs all went in their own directions. Now that MDP is back, I am slowly bringing all of the wayward children back into the fold. TechnoPrisoners was designed alongside MDP, and actually sits as sub-site, befitting its station as the first incarnation of MDP-Online. Crystal Wizard has now been brought in line, and the other sites will soon follow. While I do not profess to be a Master Web-Designer, I have put no small effort into both the technical and aesthetic sides of this design, and I hope it works for you! The colour schemes have been colour-matched, using a different scheme for each site, to represent their unique flavours, while relying on a common template. The base concept of using labelled Image Links aims to make the site both visually attractive and easy to use, giving quick recognition to each area. Rounded corners softens the look, giving a slightly more informal feel. Behind the scenes, files have been tidied, renamed and optimised, stripping away unused clutter. The code for the pages has been almost entirely rewritten, incorporating labelled areas (DIV and SECTION tags), and many design elements moved to separate Style Sheets, for ease of maintenance. I have tried to follow Best Practices for accessibility, incorporating ALT tags to describe images, and making the pages compatible with screen-reading technology for text-to-speech systems. The Dark Art of SEO (Search-Engine Optimisation) has featured, but as this Alchemy involves tainting ones soul with the ever-vain search for Impressions, Clicks and Likes, I have kept it to the minimum required. Analytics are run through Google’s offerings, tracking page hits, entry and exit pages, user flow and interactions. This anonymised data is useful for gauging interest, and locating faults, and can be used to suggest area that can use more attention. Instead of creating a separate Style for mobile devices, the base theme has been written to automatically adjust, allowing the device to display content appropriately. An important design consideration, as people have a wide range of technologies to view the Web on, with a variety of screen-sizes available. I hope this will lead to a comfortable, coherent experience for my readers, and welcome any feedback regarding the new design! This entry was posted in Art, Behind The Scenes, Computers, Design, website and tagged Art, behind the scenes, computers, website on January 17, 2017 by The Crystal Wizard. Taking my Smart outfit (colourful shirt, waistcoat, pocket-watch) as a starting point, I decided that a Cane would be a nice addition. But not just any Cane would do! P.C. Wizard demands that it be Interconnected, interactive, and wifi-compatible! GPS. So that I know where it is at all times. Weather Sensors. Why bother waiting for the local Weather Report on TV when I can just poke my Cane out of the window and get my own report! Compass. Remember all those times that you needed to know magnetic North, but couldn’t remember how to calculate it from the position of the Sun? No more being lost in the wilderness. Just point The Cane until the beeps tell you which way to go! While the actual Cane is in hiatus, I next look at the electronics needed to run the Cane Systems. First, a central Power House. The Heart of the operations. I am looking at two basic options (each with multiple ways of implementing). Raspberry PI. A fully-fledged computer that fits in a (large) matchbox. I have an older, larger version, and a friend has lent me the new NanoPI to play with. Arduino board. A Micro-controller designed for electronics projects. Both would do the job, and the PI is more powerful. Too powerful, if anything. I need to keep an eye on battery life. A little investigation shows that there would not be that much difference in getting them to work, so I think the Arduino will be the way to go. Next stop: The Electronics Point. Last time I touched a soldering iron was over 20 years ago, so a little refresher course in all things electronic is probably in order. The forums there are very friendly, and I received some very useful answers to my (probably very stupid) questions. Some good pointers on Arduino-based components and packages, too. But overall, I am still a virtual beginner. A peruse of the circuits I will be needing persuaded me that I need to relearn the techniques, and catch up on new developments. Back to the Breadboard, as they say. So, from my idea, I am now back at the basics, ready to build from the bottom up. I dug around for my old box of electronic bits, left over from college days. A quick glance made obvious my suspicions: I need to buy some new parts! A quick trip to Maplins got me the basics, and also a very interesting chat with the young lad at the counter, who gave me some good suggestions on part numbers and types of sensor. Armed with my new array of parts, I skipped over to the on-line tutorials at Spark Fun to get started! Dang, more components needed! I can’t even get started without some kind of Power! The plan is to run the breadboard from a 9V “square” battery, which I need to drop to 5V (the standard board voltage). A simple circuit, but I don’t have the right capacitors! Electronics Point recommends several suppliers, and I settled on BitsBox of Rugby. £12.01 of my hard-earned cash later, and I have ordered far more than I need, including a big box of assorted resistors (an essential for any project!). So now I am in the hands of BitsBox and Royal Mail. Tune in later for updates! This entry was posted in Art, Behind The Scenes, Technology and tagged Art, behind the scenes, electronics, Walking Cane on February 15, 2016 by The Crystal Wizard. 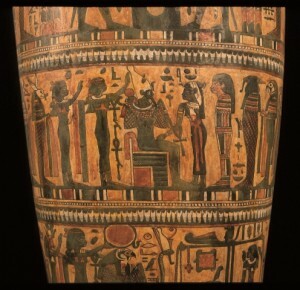 One of my clearest childhood memories is visiting the New Walk Museum, and finding they not only had dinosaurs and holograms, but also Egyptian Mummies! The Egypt section was dark, like a tomb, and a little scary for a young lad such as myself, but I was fascinated. Later, when I joined up for the Natural History Sunday Club, we would always find some time to wander through the Egypt display. They have Royal mummies, funereal urns, and even a mummified cat! Alas, childhood gave way to other, more important, things (or so they seemed at the time!). Rock ‘n’ Roll. Girls. Computers. Howard Carter and his ilk had to take a back seat for a while. But they never completely left. A friend has found letters to her grandmother, Elsie Merrall, from Ethel North, lady’s maid and companion to Lady Winifred Burghclere, the elder sister of the 5th Earl of Carnarvon! You probably know that Lord Carnarvon is not only the business-partner of Howard Carter, discoverer of Tutankhamen’s tomb, but also the inspiration for the UK TV series Downton Abbey. Ethel and Lady B travelled the world together, and Ethel wrote many letters and postcards to Elsie, telling of her exploits and adventures, along with commentary on many subjects. These letters are now being compiled into a book, ready for publication. This entry was posted in Around The World, Behind The Scenes, History and tagged behind the scenes, Egypt on September 10, 2015 by The Crystal Wizard. Upgrading software: What can possibly go wrong? I can now no longer log in to my shop! Customers appear to be able to log in, and order things, but I am unable to check the orders and process them! A few tests, and I am emailing my website hosts to let them know, and see what can be done. Of course, this is Friday afternoon! A couple of automated “We have received your email” and a request for more info leaves it at 6PM. The shop is effectively offline for the weekend! I decide to set it going, and rather than watch it, I’ll go make a coffee. By the time I’m back at my desk, the upgrade has finished, asking me to “Click here to test the upgrade” … I reach for the mouse. I click. I wait. My shop appears. No problems. I spend the next half an hour logging in and out, in disbelief! I test all the new functions, and make sure the old ones still work. I check my products and look to see which have fallen out of their categories. I never trust things that work so easily, especially just after a major failure. But The Crystal Cave is open for business again! Feel free to browse and buy, safe in the knowledge that your order can be processed quickly and smoothly. And if it does fail again, don’t worry, you’ll be the first to know! This entry was posted in Behind The Scenes, Rant, Technology and tagged behind the scenes, upgrade, website on October 10, 2013 by The Crystal Wizard.